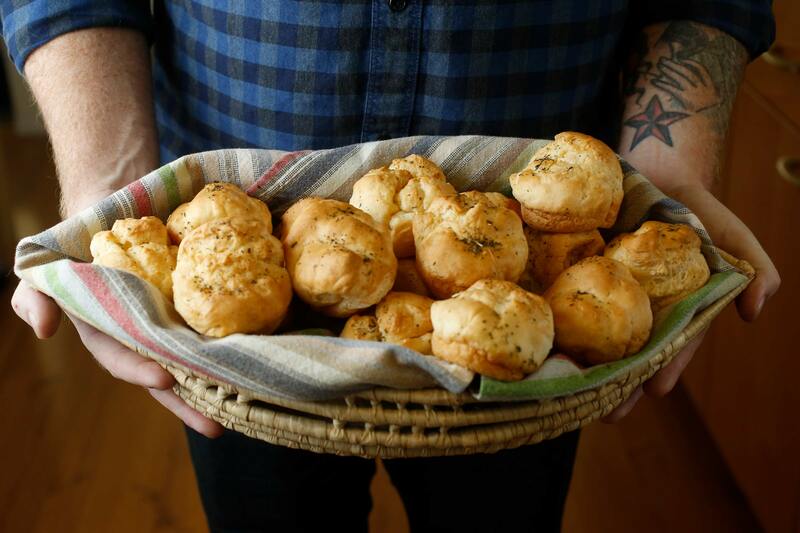 These gluten-free, dairy-free dinner rolls, discovered at Wild Fish restaurant in Northern California, manage to be impossibly light and crisp at the same time—ideal dinner companions for almost any meal. At the restaurant, they’re made with organic ingredients and served with sweet-basil or spiced-pumpkin vegan butter. Rolls can be stored in a ziplock plastic bag in the fridge for up to 1 week or in the freezer for 3 weeks. In a small bowl, combine the sugar and warm water and stir until dissolved. Stir in the yeast and let stand for 10 minutes. Sift the flours, xanthan gum, and salt together into a bowl. Preheat the oven to 350°F. Separate the egg whites and yolks. Reserve the whites and separately reserve just 1 of the yolks. In a stand mixer fitted with a whisk attachment, beat the egg whites on high speed until soft peaks form. Add the cream of tartar and beat until stiff, glossy peaks form. On low speed, add the agave, oil, vinegar, and reserved egg yolk. Add the yeast mixture and sparkling water. Switch to the paddle attachment and gradually add the flour mixture, a tablespoonful at a time, on low speed until blended. Beat on high speed for 3 minutes. Add 2 inches water to an ovenproof pan and place it on the bottom of the oven (this will help crisp the rolls). Spray 18 muffin cups with cooking spray. Spoon enough of the moist batter to fill each cup halfway. Let rise in a very warm place until the batter rises above the muffin cup tops by about ½ inch, about 20 minutes. Spray the tops of the rolls with cooking spray, then bake until puffed and golden brown, 25 to 30 minutes. Lightly spray the tops with cooking spray, unmold the rolls onto wire racks, and let cool completely. To serve, preheat the oven to 400°F, place the rolls on a baking sheet, brush them with olive oil, sprinkle with herbes de Provence and salt, if desired, and bake for 3 to 4 minutes. Serve immediately.